Reel drag plays a significant role in whether a fish will be landed safely or lost to a broken line, yet many anglers pay little or no attention to their drag setting. Frequently, throughout the fishing season, every angler should check their drag to make sure it is set properly. The more the reel is used, the more frequently the drag should be adjusted. Before setting the drag, it is important to understand the concept of drag. Drag is a word that describes the resistance it takes for line to be pulled from the reel. If the drag is set too low, it can be difficult to play a fish. If it is set too high, it becomes easier for the fish to snap the line. A properly set drag is somewhere in the middle, allowing the ideal amount of resistance for an angler to play and land a fish. Setting the drag is not difficult and does not take much time. Following a simple formula and a few easy steps will get the job done, and will likely save a few nice fish during the course of the season. The first step in setting the drag involves a simple formula, related to the strength of the line. The proper drag setting should be equal to 1/4 of the line strength. For example, if you are using, 4-pound test line, the drag setting should equal 1-pound of resistance. In order to determine the proper setting for the reel, you will need a fish scale. Connect the reel to the rod and thread the line through the eyes or the rod. Place the rod handle in a secure location, such as a rod holder. Next, tie the scale to the end of the line. Holding the scale, pull the line away from the rod. Check the reading on the scale. At what point does the line begin pulling from the reel? From this reading you can determine if the drag needs to be loosened or tightened. Reels have different mechanisms for setting the drag. It could be a dial on one reel, while on another reel it is the nut that holds the spool on the reel. Adjust the drag and test it again with the scale. Repeat until you reach the proper resistance. In some situations, it becomes necessary to adjust the drag while playing a fish. This is most common when playing very large fish with heavy tackle, which often happens in saltwater fishing. 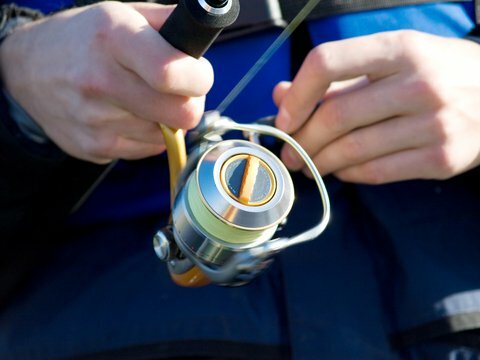 When a fish is played for a long period of time and significant amounts of line have been stripped from the reel, the drag setting can change, due to heat and the amount of line remaining on the reel. The more line that is stripped from a high-capacity spool, the more resistance it takes for that line to be pulled from the reel. When this happens, it is important to loosen the drag, to avoid having the fish snap the line. Any adjustments made to the drag, while fighting a fish, should be done gradually and slowly. A big, quick change to the drag setting could result in the loss of the fish.